A new group has been formed to replace radical Islamic cleric Omar Bakri Mohammed's al-Muhajiroun group, which was disbanded last year. Ahl ul-Sunnah Wa al-Jamma was launched in a north London charity shop, with leading member, Simon Sulayman Keeler, calling the Queen "an enemy of Islam". The convert to Islam said she was head of a country that attacked Muslims. The controversial new group is formed of ex-leaders of al-Muhajiroun, widely condemned by most British Muslims. 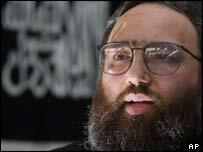 Self-styled "sheikh" Omar Bakri Mohammed, al-Muhajiroun's former spiritual leader and founder, said the organisation was dismantled in October 2004 because Muslims needed to unite together. Mr Mohammed, famous for praising the 9/11 hijackers, was excluded from Britain in August after more than 20 years, when the Home Office decided his presence "was not conducive to the public good". The same month, Prime Minister Tony Blair announced plans to ban al-Muhajiroun. Joining Mr Keeler at the launch of Ahl ul-Sunnah Wa al-Jamma was Anjem Choudary, the former UK head of al-Muhajiroun, Abu Yahya, Abu Izzadeen and Abu Uzair. The group, which claims to have up to 1,000 followers, said its purpose was the peaceful propagation of Islam, which included attending university fairs, and that it was not a "jihadi movement". When asked about Al-Qaeda's belief that the Queen is an enemy of Islam, Mr Keeler said the Ahl ul-Sunnah Wa al-Jamma group agreed. He said: "My comments are in no way a call for arms or assassination. I do not call for assassination of the Queen." But added she was sovereign of a country that attacked Muslims. "The Queen is enemy to Islam and Muslims. We are not interested in what she says, her public relations with Muslims and her subjects," he said. "We see in reality her actions all around the earth, her forces, army, navy, her air force bombing, destroying Muslims, killing our families, destroying our properties and occupying our land." He added that she was "mentioned by al-Qaeda" because "the reality speaks for itself". Anjem Choudary said Omar Bakri Mohammed was not on the cosultative committee of the new organisation but said: "We would love for the sheikh to have a role." Abu Yahya, a former spokesman for al-Muhajiroun, said: "Where the frustration has got to a level where it is uncontrollable, you have what happened in France." Mr Blair has said "successor organisations" to al-Muhajiroun would be looked at but the group's ex-leadership was markedly more measured at its launch than in the past.